According to a report released by the Giving USA Foundation, which conducts research and education on philanthropy, Americans are donating more money to charity than ever before as total charitable donations from individuals, estates, foundations, and corporations rose to US$ 373.25 billion, representing a 4% increase compared to 2014. On average, Americans are therefore giving more than $1 billion to charity per day. Individual Americans were the most generous group of givers, donating $264.58 billion in 2015, a 3.8% increase from the previous year. Below the chart of the past 6 decades of giving, showing a steady long-lived upward trend in inflation corrected giving figures. The success of giving Tuesday has also added to this peak in generosity. Therefore also check out the Giving Tuesday guide (and infographic) from Ally360 that looks at the latest data, current trends, and provides a series of actionable tips to help companies launch more successful fundraising campaigns. 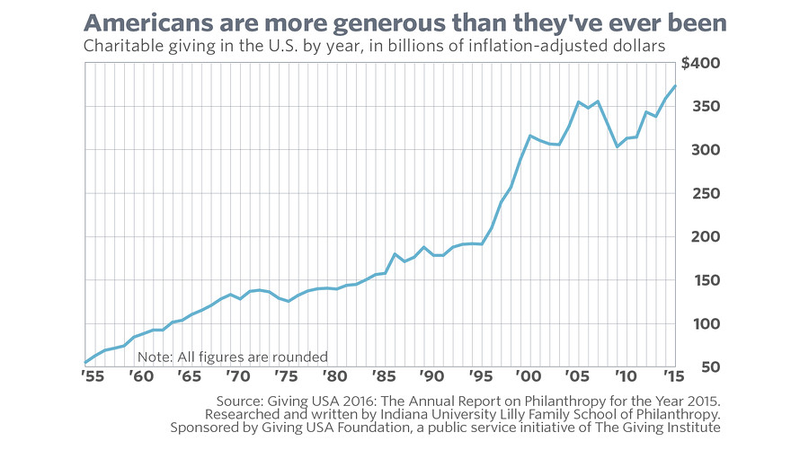 The graphic also looks closely at the little-known “great giving gap” that still exisits in America. Next story What Happened to the Made in Africa Foundation? Philanthropy	What Happened to the Made in Africa Foundation?